I have been reading and watching news about the unlikely place that boasts the highest waves on the planet. It’s not one of the more famous spots like the Banzai Pipeline off Oahu, Mavericks on the California coast or Tahiti’s Teahupo’o. Instead the little Portuguese fishing village of Nazaré has become the draw for practitioners of extreme surfing. 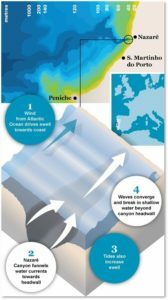 The waves that hit Nazaré’s north beach are so big because of an undersea geographical feature. A deep canyon narrows as it approaches land and points straight at the village. Winter storms push water into that canyon—16,000 feet from its bottom to the ocean’s surface—which funnels the mass of water toward land. The swells build as the water grows shallow. Right off the coastline all that water hits a sharp ledge that pushes it up into enormous waves that rear out of the ocean abruptly. They’re so big local residents long thought of the winter ocean as a place of death. Big-wave surfing is to ordinary surfing what summiting K-2 is to mountain hiking. These waves are monsters—up to the height of a 10-story building—and extremely dangerous. The ones off Nazaré are also unpredictable, Waves break all over the beach, which means there is no predictable safe zone or impact zone. Wiping out is like falling off a cliff, which then falls on top of you with tons of wild water driving you down. Full disclosure: While I find big-wave surfing fascinating, I do not surf waves of any size. I would have trouble staying on a surfboard placed on my living room floor. What drew elite surfers to this tiny place? None of them knew about the towering dangerous waves that hit Nazaré in the winter. Surfers were so focused on the Pacific Ocean that the first surfer to visit the village had never been to Europe and didn’t know where Portugal was. The answer is smart, gutsy marketing. Here are the four ways local men made Nazaré an extreme surfing magnet. Organization: In 2002, Dino Casimiro and some friends established a sports club to make water sports popular locally and to publicize the town’s big waves to the surfing community. This created a focus for subsequent marketing activities. It was headed by people who recognized the potential rolling in to their beach. Outreach: In 2007, former Mayor Jorge Barroso gave Mr. Casimiro permission to hold a water-sports competition off the town’s northerly beach, which has the largest waves. This provided surfers with a challenge and a reason to come to Nazaré. Invitation: in 2010, Mr. Casimiro invited Garrett McNamara, who held the world record for the largest wave ever surfed (78 feet), to visit Nazare. Investment: in 2013, newly elected mayor Walter Chicharro invested some of Nazaré’s budget into promoting the surfing “scene” and ensuring a professional approach. This increased outreach and ensured that surfers would be welcome in town. Any one of these things, done alone, probably would not have brought a surfing safari to their Portuguese village. But three different men took a gamble, supported one another, and made big decisions and a risky investment. The results have been amazing. 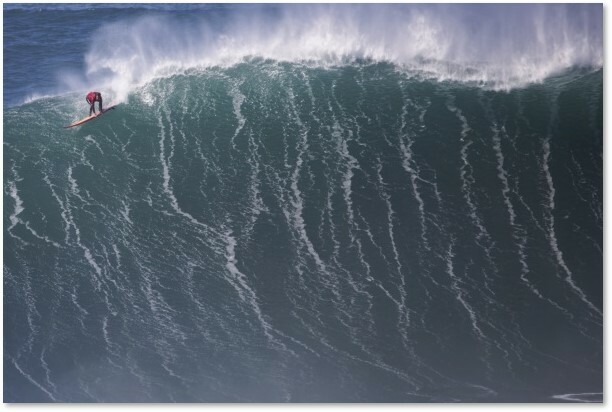 In 2011 Garrett McNamara set a new world record by successfully riding a 95-foot behemoth. Rodrigo Koxa broke the record again last year with a 100-footer.. In 2014, about 40,000 people visited the village, mostly in the summer. They left in September, reducing the population to 10,000 over the winter—which is when the big breaks roll in. More than 220,000 people have come to Nazaré so far in 2018. You can find about 20 professional surfers in Nazaré in any given winter week. The village now houses a surf school, and has hosted a surf-themed film festival. The World Surf League, the governing body of professional surfing, runs regular competitions in Nazaré. A whole new industry brings money into to the village from surfers and tourists who come to watch the surfing. It means profits for restaurants, inns, property owners, and equipment rental stores. 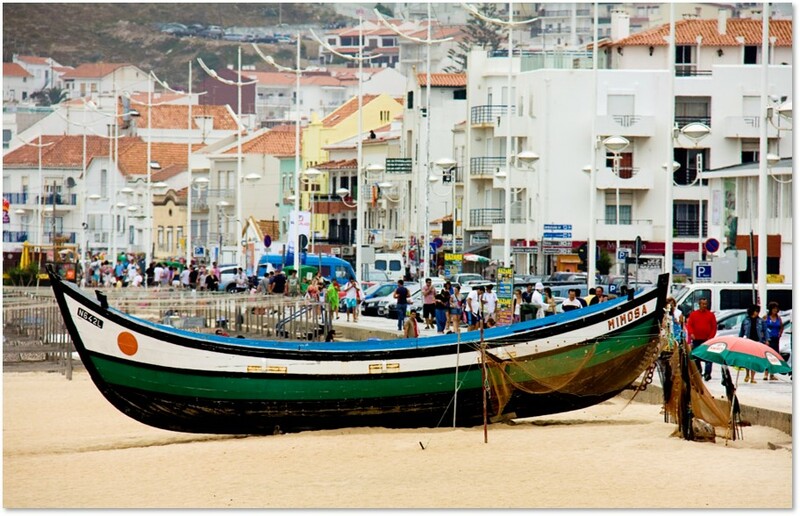 What can we learn from Nazaré’s marketing success? Look forward, not backward. 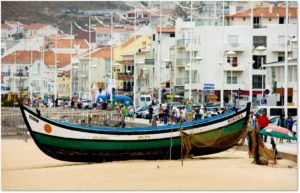 Had any of the men involved in this venture thought of Nazaré only as a fishing village with a few summer visitors, none of this would have happened. Instead, Dino Casimiro looked beyond the danger in the monster waves that everyone avoided and saw opportunity. Lesson: It’s really easy to shoot down someone else’s idea or remain so firmly grounded in the past that you can’t see beyond the way things have always been done. The world changes every day. Be willing to change with it. Support one another: The other men might have called him a dreamer, stupid, out of touch, and crazy, then refused to back him up. Instead they put ideas, hard work and money behind his vision. The whole village got into it, and restaurants even provided Mr. McNamara, the big-wave point man, with discount meals. Lesson: Nothing is more attractive than sitting in a meeting and pointing out the flaws in a colleague’s idea. Some people make a whole career out of it, reveling in their negativity and the power to destroy. But, no one ever started a company, built a successful corporation, or founded a whole new industry by shooting down someone’s else’s vision. Take a risk and jump in with both feet. By its very definition, risk means that you may fail. Even big-wave surfers wipe out. They might have refused to see beyond the mighty Pacific to a small beach in Portugal. The film festival might have failed. The villagers might have refused to feed Garrett McNamara at a discount or driven him out with jacked-up prices. He might have died surfing one of those monsters. Messrs. Casimiro, Barroso and Chicharro took huge risks and put their all into it. Lesson: Too often executives shrink from risk in marketing. They demand their marketers take only a “guaranteed risk,” which is, of course, no risk at all. And if a marketer does go out on a limb, they are only too willing to cut it off if big results aren’t delivered immediately. Nothing stops innovation like the fear of criticism–or being fired. Back a vision with real money. It must not have been easy for Mayor Chicharro, a new official, to spend some of his limited budget on promoting something the villagers saw only as a danger. Surely there were stronger, more immediate demands on Nazaré’s money. He must have taken a few deep breaths before embarking on his marketing venture with no guarantee that it would work. Lesson: Don’t expect your marketeers to “do more with less” and succeed. Don’t expect the same results from their limited budget that Google or Microsoft or Apple get with their much larger investments. You have to spend money to make money and the Marketing department can’t deliver immediate, quantifiable results on a shoestring. Give them the money they need to do the job. Make the most of existing resources. Mayor Chicharro turned Nazaré’s old Forte de San Miguel Arcanjo on the point overlooking the ocean into a viewing spot for tourists, photographers, and prospective surfers. Instead of protecting it as an historical artifact, he turned the fort into a new attraction, thus saving the town the cost of building a new site and generating revenue to keep it maintained. Lesson: Take stock of the resources you have and make the most of them. Don’t assume that everything you need must be built from scratch. Get creative. Think, as they say, outside the box. You’ll be surprised with what you come up with. Just do it. None of Nazaré’s visionaries spent years on a business plan, hired advisors, worried about their KPOs, or committed to rigid goals and objectives, They saw what could be done and they did it. Lesson: Don’t think you need to spend months and millions on expert advice from a marketing consultancy. You know your business and your industry better than they do. YOU are the experts. Now take a deep breath and, whatever your vision is, just do it. 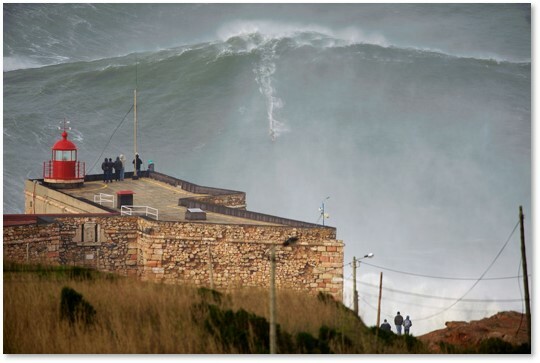 While I don’t surf, I would stand on Nazaré’s fort and watch surfers attack and conquer the monster waves. I can imagine the power, the grace, the thrill—and the roar of the waves hitting the rocks. Still photographs don’t do justice to the display of natural power. You have to watch some of the videos below. People now go there every day, experiencing the enormity of the world’s biggest waves in a world-famous place that once had been only a small fishing village. 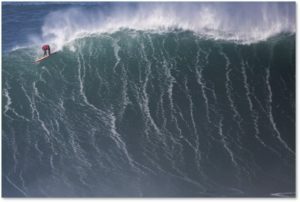 This entry was posted in Business, Travel and tagged big-wave surfing, Dino Casimiro, Garrett McNamara, Jorge Barroso, Nazare, Portugal, Rodrigo Koxa, Walter Chicharro, World Surf League by Aline Kaplan. Bookmark the permalink.